Rained off: South Shields service was called off. the organiser of South Shields’ main Good Friday parade has defended the decision to cancel yesterday’s event because of bad weather. For 164 years, people have gathered in the town centre to take part or watch the traditional Easter procession and service. Alan and Mark Crozierhad turned out to see the parade. However, families who turned out to line the route waiting for yesterday’s Procession of Witness, had been unaware it been cancelled 15 minutes before its scheduled start. The event, organised by the Sunday School Union, should have seen marchers gather at Laygate before making their way along Westoe Road and Fowler Street, before a service in the Market Square. Organiser Sandra Jack said: “Due to the weather, it was decided to call it off. “We have got a lot of older people and young children who are part of the parade and we felt it was unfair to make them stand out in the rain. In its 164 years history it has been cancelled before – 22 years ago – it was put off because of the rain. “It has always been of the opinion that if the weather was too bad, everybody would have services in their own churches. Mark Crozier, from South Shields, was one of a number of people who had turned out to watch the parade along with his family. As a young member of the Boys’ Brigade he had taken part in the parade. FULL HOUSE ... Jarrow Baptist church, Good Friday Service. He said: “I have been coming to see the parade since I was a bairn – I’ve even taken part in it. “I have been telling people to come down to see the parade as we should support events like this. 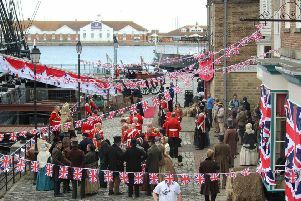 Did you see the National Museum of the Royal Navy Hartlepool on latest episode of Victoria? Another Procession of Witness, due to set off from Harton Lane ahead of a service at West Park, was also affected. Meanwhile, in Jarrow, a service which had been due to take place in the town centre was moved indoors at the nearby Baptist Church, due to the rain. The service was led by Rev David Osman and was attended by the Mayor and Mayoress of South Tyneside, Coun Fay Cunningam and Stella Matthewson. Coun Cunningham, who has taken part in the Good Friday parade as a young girl, said: “It is so disappointing the parade has been called off due to the weather, as I’m sure there would have been lots of children looking forward to taking part.